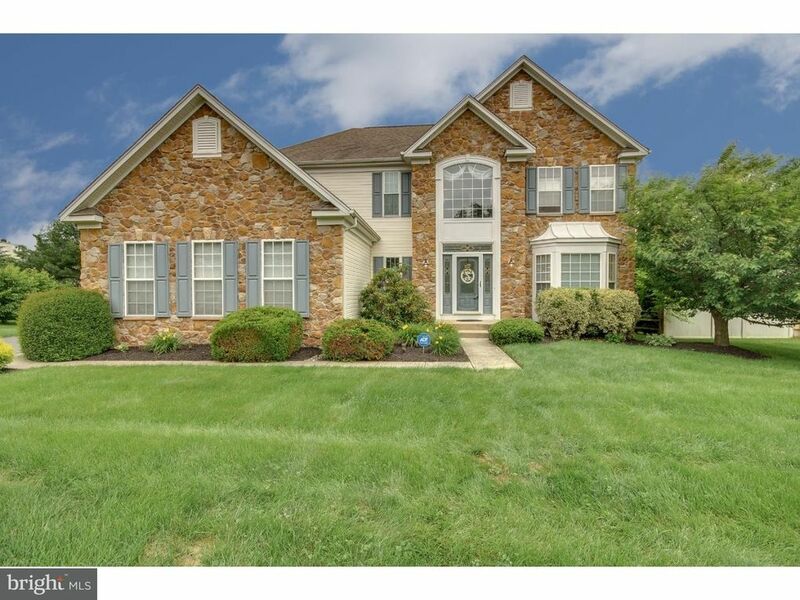 Gorgeous expanded 2-Sty Stone front Colonial features 4 bedroom, 2.2 bath. Custom leaded glass front door, with leaded glass transom above and leaded sidelight panels. 2-Sty foyer (11 x 13) with hardwood floors, waterfall oak staircase to 2nd floor. 9Ft ceiling 1st floor. Foyer open to formal living room with enlarged bay front window, custom crown molding and large open casing to formal dining room. Dining room features tray ceiling, chair rail and large custom bay window. Beautiful custom lighting, double basin stainless steel sink with transom window above. Gas stove with built-in overhead microwave. Granite countertops, extensive white 42 cabinety features secretary desk. Kitchen opens to family room with gas fireplace on back wall with fluted mill work; custom hearth, custom millwork and transom window above fireplace. Oversized windows with transom above flanking each side of fireplace. Double french doors from family room opens to study. Utility/mud room off foyer leads to 2-car side entry garage. Powder room with over sized window. Expanded Master Bedroom with walk in closet, tray ceiling and ceiling fan. Alcove used as a sitting area. Luxurious master bathroom with double vanity, jazuzzi tub and large separate shower. Three additional roomy bedrooms with roomy closet space. Full finished basement with powder room, pedestal sink. Berber carpeting, recessed lighting, spindled staircase. Additional finished room for additional storage. Intercom System throughout home. Huge deck overlooks beautiful level back yard.